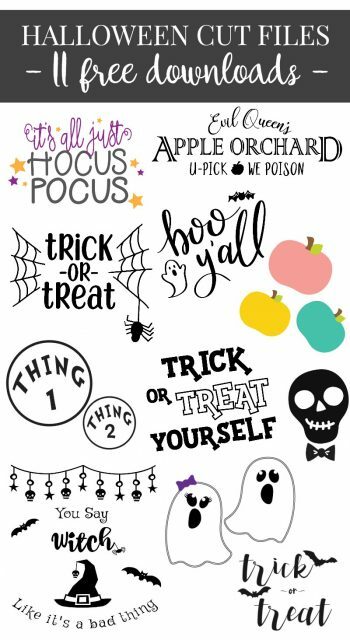 If you are looking for new Halloween SVGs you’ve come to the right place. 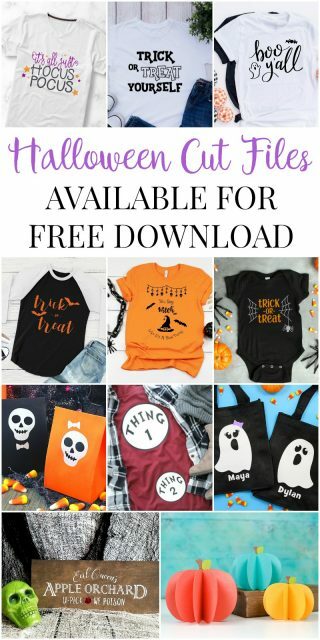 Sarah from Simply Crafted Life has organized this Halloween SVG blog hop – so you get 11 new free SVGs to use in your Halloween crafting this year! 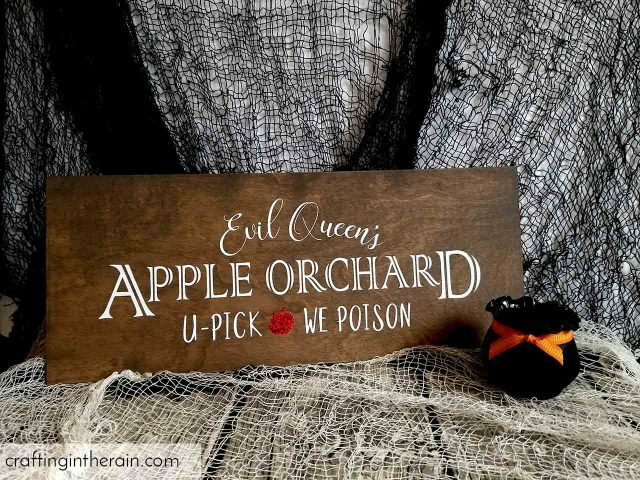 I’m making a Halloween wood sign, and will show you tricks for how to iron-on vinyl on stained wood. 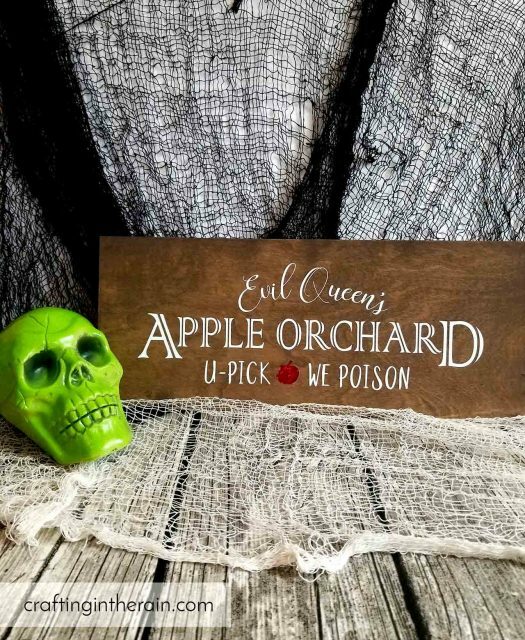 Click here to download the Evil Queen’s Apple Orchard SVG. Resize the file for the size of your project. Since some of the font lines are so thin, I recommend cutting this to be at least 5 inches tall – feel free to go bigger! If you want to change the color of the apple, simply use the contour tool. Not sure how to use the contour tool? Don’t worry, it’s easy! You will first want to duplicate the file so you have two on your canvas. Select one, then click the contour button on the bottom right of the screen. Scroll to the bottom of the pop-up and click “Hide all contours.” Then click on the apple so that line reappears. 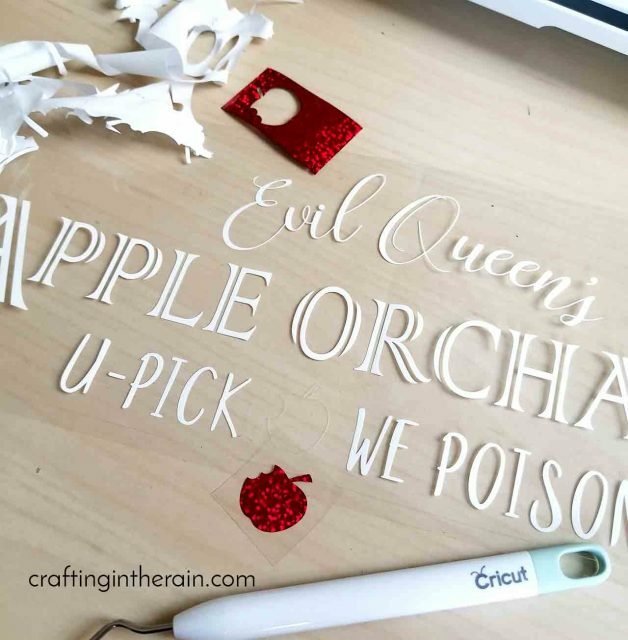 Cut the words using white iron-on (remember to MIRROR) and place the vinyl shiny side down on the mat. 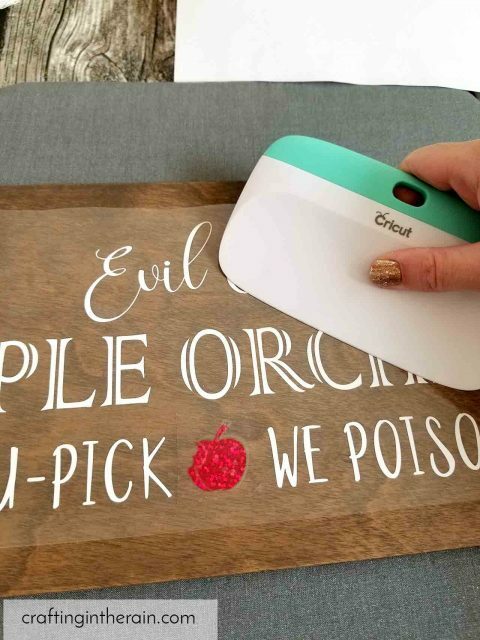 Cut the apple using your second color – I used red holographic iron-on. Again mirror, and use the Custom Materials search to choose holographic iron-on. Weed out the extra vinyl. 1 – Let the stain dry at least 24 hours, paint should dry 2-3 days. 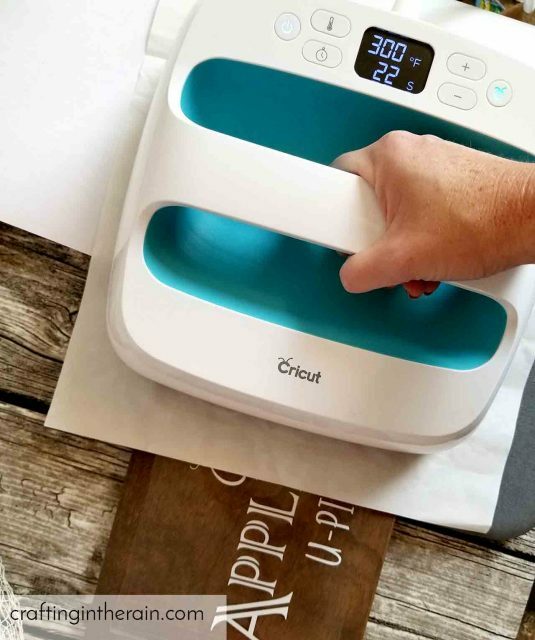 2 – Remove any excess moisture from the base by placing a piece of plain copy paper over the wood, then pressing the EasyPress (at 300) for about 30 seconds. Then move the paper down the wood and repeat until the wood has all been heated. You can see on my paper, this was drawing out some of the stain. Great! I want it to transfer to the paper, and not mess up my iron-on. Let cool before moving to the next step. 3 – Cover the project with a teflon sheet or parchment paper to protect the wood. Set EasyPress to 300 degrees and 40 seconds. Press entire design. 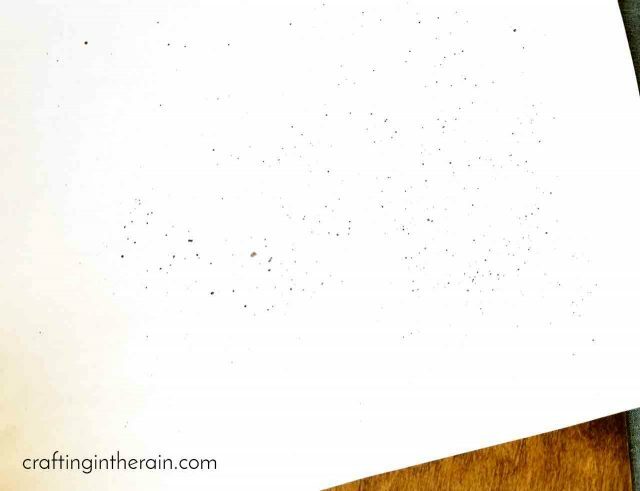 4 – After the iron-on has been pressed on the wood, don’t remove the carrier sheet right away. Use a scraper tool to lightly press over the entire design. Then wait for the vinyl to cool before peeling the plastic away. 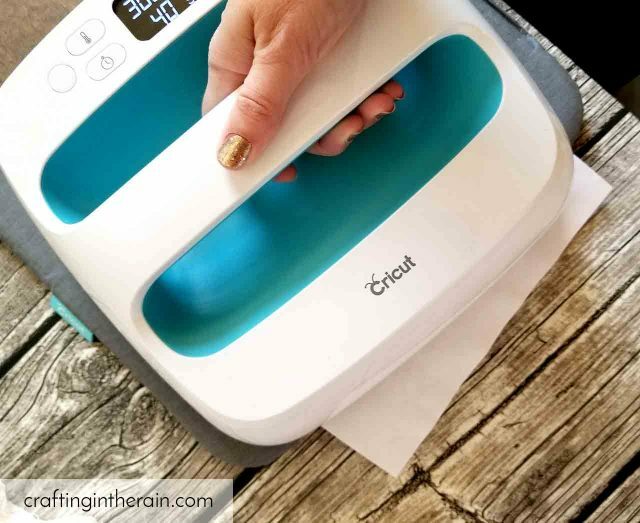 Normally, this would type of iron-on would be a “Warm peel,” meaning you remove the plastic while everything is still warm – it’s just cooled enough for you to touch the corner and peel it up. I found though, that the iron-on was starting to come up with it, and when I waited for it to cool, it worked much better. Again, since this wood is stained. I hope you like it! Be sure to visit these other posts for more free Halloween SVG files. Oh how I love this, let me count the ways!!! Thank you for the SVG. I’m featuring your sign when my link party opens up tonight! So fun and cute. I want one of these for my house too.